Martin Scorsese once said that Hong Sang-soo’s movies begin in an unassuming way—(which makes some liken the writer-director to Woody Allen)—but then the unpeeling begins. There’s no way of knowing, then, when a simple conversation between two people, will turn into something both capricious and daunting, as though a given person chatting with others might be as banal as a weather report, but then, a tsunami of rising emotions turn the talk into a fierce dressing down of a partner. “Grass” has its store of people who are narcissistic and needy, but whose conversations are likely to turn off the people who must listen to the words of these flawed people. 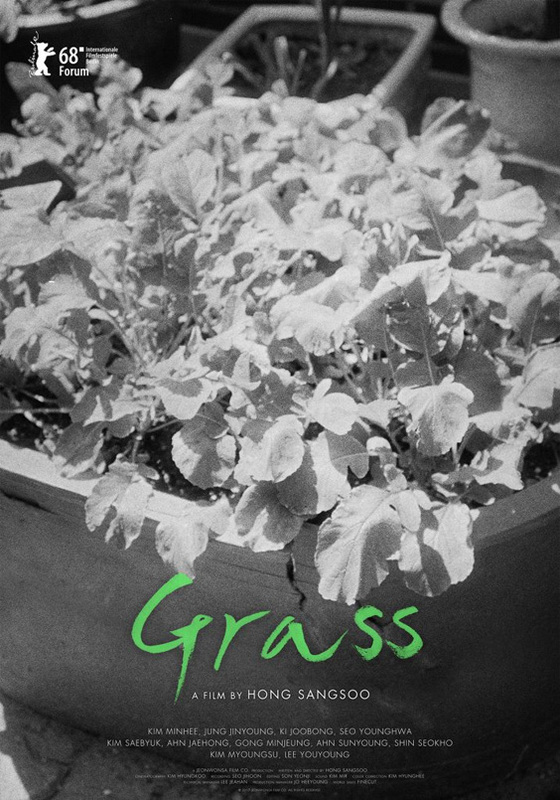 Filmed in black and white by Kim Hyung-yu, “Grass,” which embraces the three classical unities of time, plot and space, eavesdrops on four conversations. The chats are followed at a nearby table by Areum (Kim Min-hee), a writer who scratches the conversations out on her Apple laptop. Or perhaps the scenarios are actually created by Areum, who stands in for Hong Sang-soo, who writes as well as directs the film. At first, two people coming across as either shy or afraid to bring up repressed emotions, are asking “how are you?” questions, avoiding eye contact, until the real subject emerges. The girl (Gong Min-jung) seated across a table from a boy (Ahn Jae-hong), begins yelling, accusing the gent of responsibility for the suicide of a mutual friend. He thinks she’s gone nuts and says so, but in a brief minute or so she calms down, conversing as though the outburst never took place. Similarly,in a chat between two others, a middle-aged actor (Jung Jin-young) seeks a partnership with a younger woman (Kim Sae-byuk), urging her to join him in writing a screenplay. Not exactly Lerner and Lowe or Rodgers and Hammerstein, the girl nixes the suggestion. An out-of-work actor and would-be writer, the same Kyung-soo (Jung Jin-young), begins a conversation with the writer Areum, hitting on her in an outrageous way by asking her to allow him to observe her at her home for ten days as a model for a future screenplay. Around the room again we find a middle-aged woman, Sung-hwa, (Seo Young-hwa) fending off a proposal of a friend (Ki Joo-bong), who is desperate for a place to live and asks her permission to move into her digs. Obviously that has a much chance to fly as the would-be courtship between Kyung-soo and Kim Sae-byuk). You could predict the writer-director’s trajectory simply by noting the title of his first directorial project, “The Day a Pig Fell into a Well.” You might think that Hong does not have a script prepared well in advance. You would be right: he knocks out a tentative script hours before filming, making changes as he sees fit. His stories generally takes place on peaceful streets far outside Seoul’s business district, in coffee shops and in lobbies of apartment houses. This quaint, charming dramedy played last year at New York’s Film Festival and should be seen by those who take pleasure in scenes of domestic realism.